In a Colorado Senate race, Bob Bacon faced off against Matt Fries. 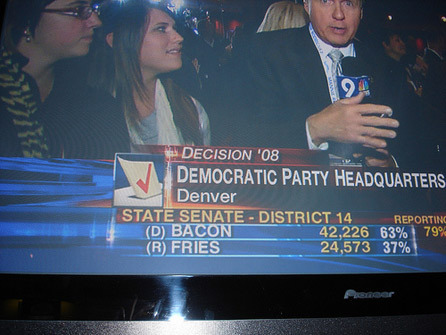 Via Serious Eats, this Colorado Senate race, between Bob Bacon and Matt Fries, may have been the best ever. Clearly, I would have voted for Bacon. But frankly, I sort of wish he had lost, because then someone could have made bumper stickers and T-shirts that read "Don't Blame Me, I Voted for Bacon," and that would have been awesome.